Lost in a world of DNA. This week I’ve finally looked at my Family Finder (autosomal) DNA results from Family Tree DNA. I’m a genetic novice so I’m in a state of complete confusion wishing I’d paid more attention previously. You wouldn’t think I’d ever done science as I sit bewildered by it all. Matrilineal DNA (MtDNA) and X-DNA are also less of an issue because I again “know” what my line is, even though there’s more work to be done the conventional way. I do have a few first cousins on this line though two of them I haven’t seen since I was about 10. My only uncle on this line had no children…another brick wall on the Y-DNA chart. Autosomal DNA seemed to be the best strategy for me, enabling me to look at my other 22 chromosomes and their genetic matches. WHAT WAS I HOPING FOR? Like anyone (pretty much) with Irish ancestry I hit a brick wall around the time of the Famine, with the limited availability of records. There are also a number of lines for which I only have parents’ names (from shipping lists) and a few where I have nothing before them. These are all at the 6th or 7th generation level, which would bring in 4th or 5th cousins – this seemed just right for the Family Finder DNA test. To link with someone who has Sherry DNA from Ireland (I have nothing pre-1860). To see if I got any new “hits” on my Partridge line enabling it go back further. Any other connections that arose. As anticipated, no 1st or 2nd cousins, as yet anyway. I suspect there’s some bias in the database in that more Americans are being tested overall (well there are more of them than Aussies anyway). Many of those tested seem to have long lines in the US, making close relationships unlikely….I hadn’t anticipated this, logical though it is. FTDNA did find three matches at the 3rd cousin level. That’s pretty close as we should share a genetic link at the 2 x great grandparent level. My best link is to someone simply listed as “F” with no further details. We have the greatest overlap of 60.29 cM and a longest block of 32.09. How frustrating not to be able to contact them. I’ve contacted the other two 3rd cousins and they have replied but so far there’s nary a suggestion of a family link in their tree that I can determine. Can you tell the why I’m getting confused? I got a fair number of 4th cousins and have contacted some of them. Initially the e-book by the Genetic Genealogist suggests that at this level, the DNA overlap could be coincidental (IBS –Identical by State) rather than due to biological inheritance (IBD or identical by descent). At this point I went back to focus on my 3rd cousins. However FTDNA’s FAQs suggest that their statistical modelling ensures matches are IDB not IDS (FAQ 12). So that makes both 4th and 5th cousins worth investigating in more detail. Firstly I thought I was going to have a pretty DNA image to play with…should have read the manual first. However I’ve downloaded the raw data which as yet is purely Double Dutch, as they say. 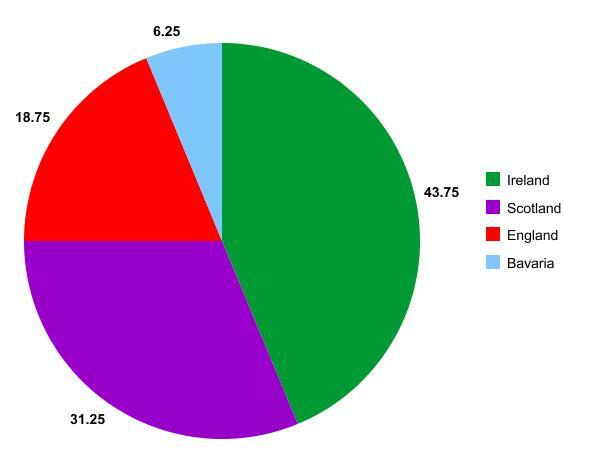 My pie chart for documented ancestral birth places. I also used the Population Finder tool and got something of a surprise. I expected all of mine to be in the Western European category. To a large extent this was correct BUT I also got another 4.43±1.52% from the Middle East. This percentage compares very closely to my German ancestry which suggests to me that it’s this line which originates in the Middle East. This was a surprise as this is one of my longest lines which I can trace back to Bavaria in the early 1600s. My population finder map from Family Tree DNA. As well as the list of 4th cousins, I also have a whole gaggle load of 5th cousins who I will need to investigate further. Some people have email contacts and some also have surnames of interest and GEDCOMs uploaded. I’ll work through those first. I’ve had a play with the chromosome browser and put my closest/best matches onto that. Of course the elusive “F” reveals a good block of common DNA! I can only hope they come looking for me. Does anyone know if the Population Finder map will show highlighted areas in continental Europe or always just the UK? Has anyone used GEDmatch for further comparisons? If so what were your experiences? So there it is, my first foray into the world of genetic genealogy! I feel rather as if I’m in the deep end with my nose barely above the water line while I should be in the toddler pool. There’s much to learn and I’ve been very grateful for Kerry Farmer’s Unlock the Past book on DNA for Genealogists. Seems like I have a lot more reading to do so I can understand this better. My reading will include a number of my Genimates who have written about this topic. Now I have my results, I’ll be more able to see how they can help me with ideas etc. Have I misunderstood anything/made a mistake in the process here? Please jump in and let me know. Also feel free to share your experiences with autosomal DNA. This entry was posted in Family History, Genetic Genealogy and tagged DNA, genetic genealogy by cassmob. Bookmark the permalink. I enjoyed reading this. I knew nothing about the process, and it was interesting to read about it. Thanks Sheryl. I know what you mean….when Aillin (Australian Genealogy Journeys) wrote about hers a while ago it was interesting but cryptic to me -now it means more than before. No doubt you’ll hear more in coming weeks. Similar to Sheryl, I have no knowledge of this either, apart from doing some genetics at uni. So far I have had no desire to look into my DNA, but perhaps that will change as time goes on. This is a helpful starter lesson though! Thanks Prue..wish I’d done some genetics at uni in lieu of chem and physics 😉 I was quite averse to the whole DNA testing thing until recently but I’m coming to the realisation it has some uses. I did my Autosomal DNA test with 23 and me. I also did the MTDNA. Like you there are no relative in my father’s male line. I have had some close cousins identified, however they won’t respond to queries! I’ve had lots of distant relatives identified but we can’t figure out when or where. Frustrating but not unexpected. Hope you find some answers. I also match F distantly I think. A largest block of 32 cM is bigger than any of my matches so far. I hope F is interested enough to contact you… how frustrating. I have used Gedmatch where you can compare with 23andMe tests if they have also uploaded their raw data. Gedmatch also has several different admixture tests which compare with data from different populations and can give different colourful ethnicity graphs, quite fun. I have been told to not take the mid east result too seriously as it could just represent something south east of the British Isles, or just a different population than Orcadian which is what the current British Isles population sample on FTDNA is. 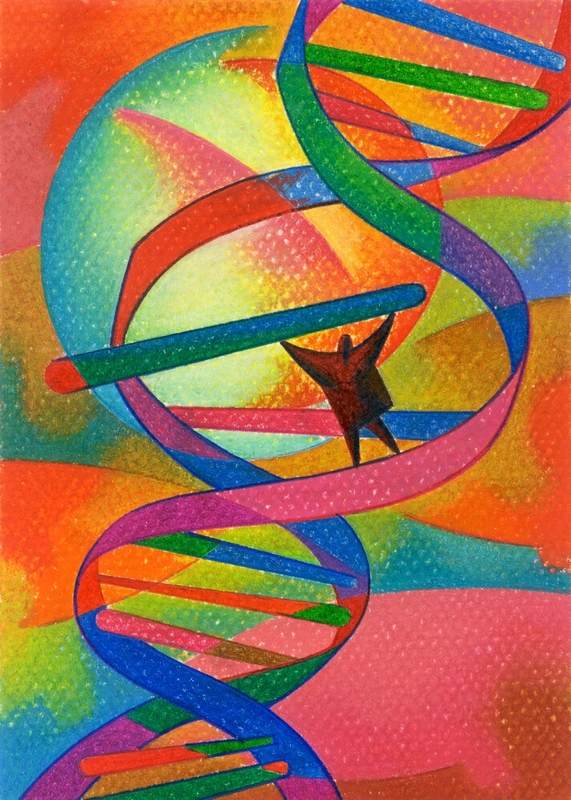 I read recently at the DNAeXplained blog that the FTDNA will soon have new tools added. My Mum will also soon have Family Finder results! Yes I do have concerns with the privacy statement and thought for a long while before I decided to try Gedmatch. The Gedmatch administrators were quick to reply to emails and when I wanted any data removed they were quick to do so. I read a blog recently which stated that FTDNA says you should be cautious using Gedmatch because features like the Triangulation utility can show your matches names to others, so that is a concern . I have asked for my data to removed from Gedmatch for the moment while I have a bit of a rethink. So, I guess while I did find the tools interesting, if you are cautious about using Gedmatch I would wait I think. I did FTDNA as well and have only found 3 definite family line matches out of 42 pages so far. The problems – not everyone provides a pedigree or even family names, and many people do not respond when you write to them. (I have to wonder what they thought they were paying their money for.) I found quite a few more definite to possible matches on Ancestry, but they do not provide the chromosomal information that enables you to identify which lines belong to which segments. Like most of you I am completely frustrated and a little confused by the DNA & Genetics questions. I can recommend Debbie Kennett’s and Chris Pomeroy’s books. Both are also members of the Guild of One Name Studies and I know the DNA question has frequently come up within the confines of a ONS. Thanks Julie, that will be especially helpful with Peter’s DNA testing I think as we’re hoping it might reveal which of the English Cass families he derives from rather than hitting the wall circa 1800. I too am attempting to use DNA testing for genealogy, as explained on http://genie-leftovers.blogspot.com/. For anyone who is just getting started, I recommend the series of four easy-to-read articles by CeCe Moore at http://www.geni.com/blog/dna-testing-for-genealogy-getting-started-part-one-375984.html. The summary in part 4 explains how to decide which DNA test is right for you.